Our bands Not only fit brands listed, are compatible with any watches ( including traditional and smart watch) which use the standard spring bars with the width of 20mm.To determine proper width for your watch,measure the width where current band attaches to the watch head.It is important that the width of the ear of the watch exactly matches the width of the band you choose. Measure the distance between the belt and the case. For example Panerai Watch,Bell & Ross Watches,Tag Heuer Watches,Oris Watches, Seiko Watch,Timex Watch,FOSSIL Watch,Casio Watch,Cartier Watch,CITIZEN Watch,Tissot Watch,IWC Watch,OMEGA Watch,Longines Watch,JAEGER-LeCoultre Watch,PIAGET Watch,Swiss Army Watch,Smart Watch, Asus Zenwatch,Aposon Watch,COACH Watch,LIBER AEDON Watch,Pebble Watch,Tiffany Watch,Seiko Watch,Timex Watch,Huawei Watch,LG Watch,Moto Watch,Samsung Gear,Withings Watchetc,Armani. Compatible with any traditional or smart watch that uses 20mm spring bars, for example [for Panerai Watch],[for Bell & Ross Watches],[for Tag Heuer Watches],[for Oris Watches] [for Seiko Watch],[for Timex Watch],[for FOSSIL Watch],[for Casio Watch],[for Cartier Watch],[for CITIZEN Watch],[for Tissot Watch],[for IWC Watch],[for OMEGA Watch],[for Longines Watch],[for JAEGER-LeCoultre Watch],[for PIAGET Watch],[for Swiss Army Watch],[for Smart Watch] etc. Top leather watch Strap, 100% Genuine Leather Band is made of premium soft top genuine leather with fashionable craftsmanship. The large-size stainless steel buckle insures stability and ease of use. Quick release watch band, install it by sliding the spring bar into place simply . No additional tool is required, quick and easy to install. 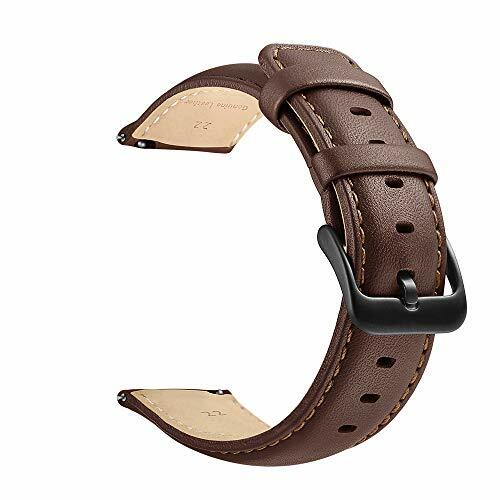 Adjustable Strap Length with 9 holes for length control which allows you to adjusts the length to fit your wrist freely, Classic style for men and women. WARRANTY: 100% CE Satisfaction Guarantee for 1 year and refund without question in 15 days. Note: Only bands. If you have any questions about this product by LEUNGLIK, contact us by completing and submitting the form below. If you are looking for a specif part number, please include it with your message.